Podcast Episode 3: Planning your painting ahead or not? Podcast Episode 3: Planning your paintings ahead, or not? Note: I created a free workbook about exhibition planning. You can download it from the library! The topic of today’s podcast is: ‘Is it wise to plan your paintings ahead?’. I am tackling this question because I have been planning my painting a lot lately. And I’m wondering: is this wise? And I’m also curious: what do you think? What do you do? Do you plan your paintings ahead, or are you following your impulses, and see how far you come? When I came back from my vacation in France, I decided that I wanted to have an exhibition before the end of the year. I just felt like I wanted to make this jump. I want to earn money with my paintings, and I don’t want to be dependent on gallery’s, so I’m planning to exhibit in December, live and online. I want it to be a ‘pop up-gallery’ for only one weekend. I want it to be live, here in Utrecht, which is the city where I live, and where I can invite friends, and friends of friends, and where people who are just passing by can hop in too. But I also want to make this pop-up gallery a two-day online-event. I don’t have any experience with this, but we’ll see. 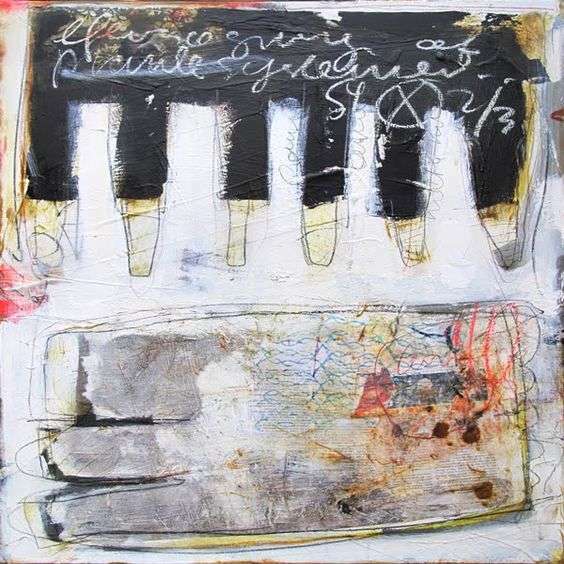 I also decided about the number of paintings I wanted to make: I want to make at least six 80 by 80-centimeter paintings, which is 32 by 32 inch. For me, this is quite a big statement, since I don’t have a space to exhibit yet and I don’t have any paintings ready! I have a date though (the weekend of 15 and 16 December). And that’s always a good thing to start with. Now I’ve had a lot of thoughts about this. It is the first time I have ‘declared’ this kind of a plan. Usually, I think: Let’s first see if I can finish these paintings and if I can find a space to exhibit, and then I will see if I can make things happen. Now I decided to turn things around. I start with the end in mind and from now on the time is going to tick. My question for this podcast is: what are the pros and cons of such a project? I find it very stimulating to have a plan, a goal. It gives direction to my painting. When I paint, I know it’s part of a bigger project. Second, and this is related to the first point: the chance that I get paintings finished is bigger. If I have a goal in mind, I might work harder to really get the painting finished. It challenges me to not give up too soon, or procrastinate painting. Third, it gives people the possibility to follow the project, instead of only see the end result. This might be interesting. I know that I would find it interesting to follow projects like this since I’m always interested in the processes of other painters. Certainly, there are cons. I find it frightening and unsettling to make a statement like this. This project might fail, I might not finish the paintings, I might not find an exhibition space, nobody might buy my paintings. I might feel too exposed and think that I’m making a huge fool of myself. I might feel stressed. I might lose the fun of the process since I paint more product-oriented. 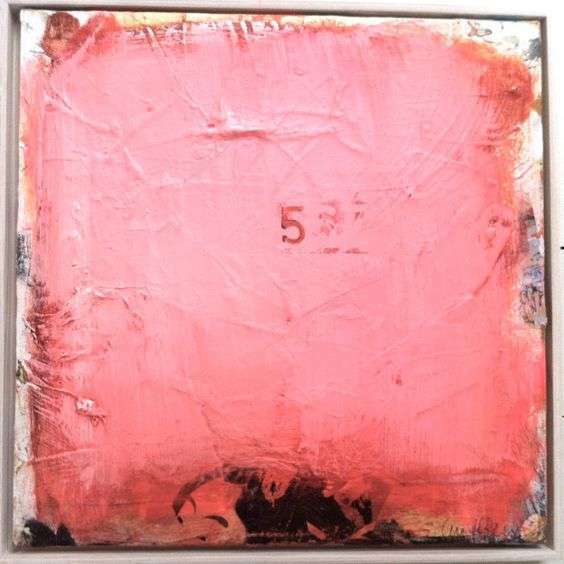 And I’m always such a big fan of process-oriented painting! Don’t those two clash? As you know, I finally decided to make the jump anyway. The fact that it’s frightening means also that I’m stretching myself. And I tend to stay on the safe side with these kinds of things, so it’s a possibility for growth. Until now I don’t feel that I am spoiling the fun of the process. Once I get my brushes ready and put the first stroke onto the canvas, I get in the zone of painting and lose track of time. At least: that’s very often the case. And if it does not work out, and the whole plan is completely unrealistic, well, I have an invitation for an exhibition for Spring 2019. Then I will postpone the whole thing for five months. Nothing is lost, and I have learned a lot along the way. My question to you: what do you think? Now my question to you is (and I’m really curious) – what are your experiences? Have you ever made a plan like this? What is your experience? And if you haven’t: would you like to do something like this? Or wouldn’t you? And why? Lots of questions, and I’m looking forward to your answers in the comments! Thanks so much for listening or reading! 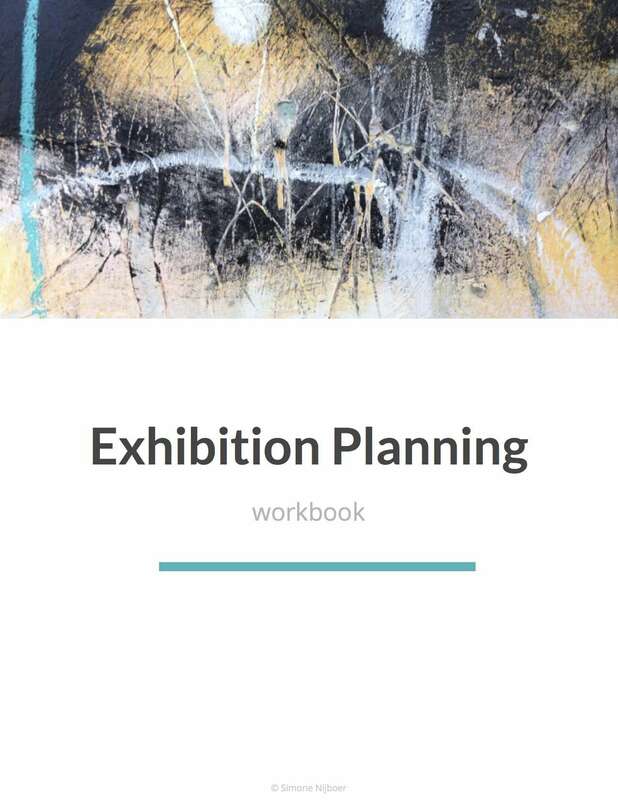 You can download the workbook about Exhibition Planning from the free library! You can find the link to my online course about collage making here. Go to the free library to download your Exhibition Planning workbook! Getting out of your comfort zone as an artist is not always easy. But it is essential for your growth as a creative. Maybe it’s even necessary to become one in the first place. That’s what my very first podcast is all about. My entire painting adventure has been one endless sequence of getting-out-of-my-comfort-zone-moments. Recording this podcast was the next one in line. As a non-native English speaker, I always thought that things like podcasting were out of my reach – since I was afraid that I would sound like a fool on audio. Maybe I do, but here it is: my very first podcast! In this podcast, I will share a bit of my painting history, with all the uneasy and frightening moments that accompanied it. 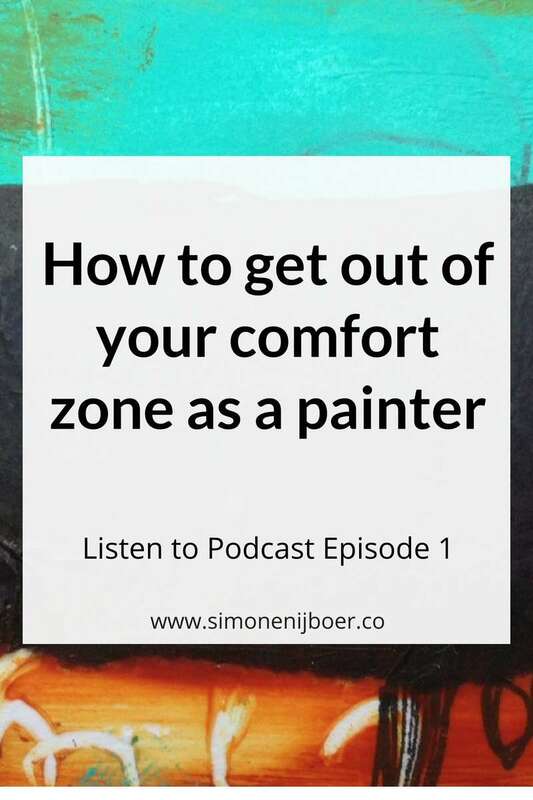 At the end of this podcast, I will ask you a few questions, about your next steps out of your comfort zone. Long before I started painting, I fanatically skimmed the Internet for artists who inspired me. I stored pictures of their paintings as photos in my photo library—it was long before I discovered Pinterest and Instagram—and very often looked at them. Just watching the colors, the compositions, and the soul in these artists’ paintings filled me with joy. I believe this joy was what made me start to paint. I wanted to put my heart and soul into painting as they did, too! 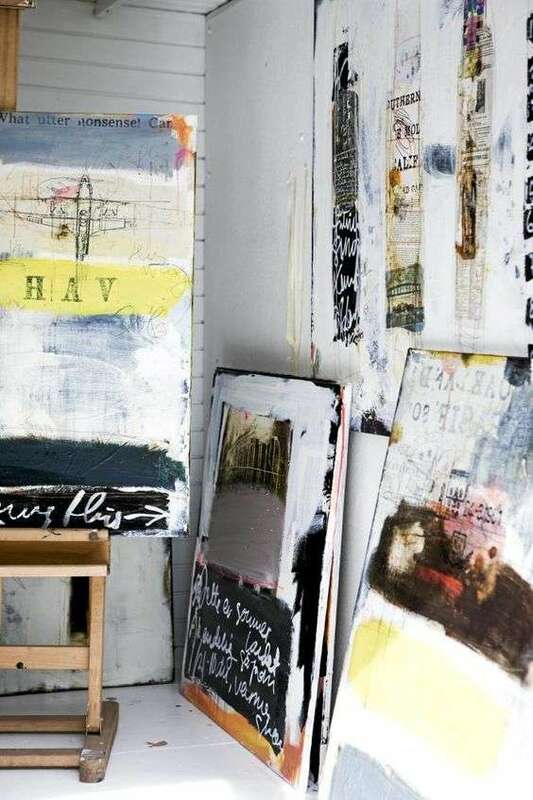 One of the first painters that I discovered was the Danish painter Line Juhl Hansen. 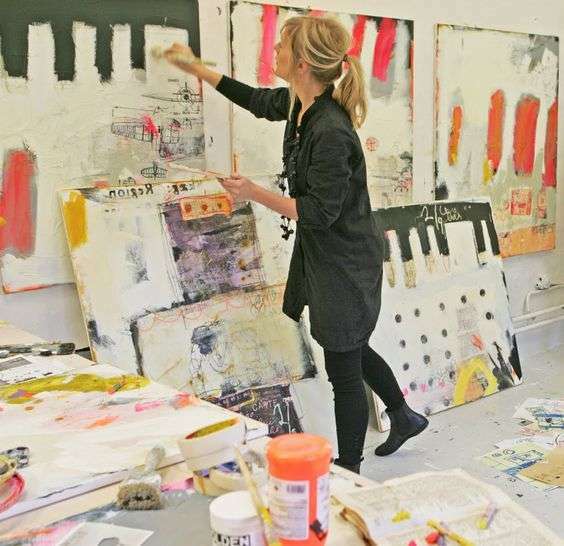 I fell in love with her work at first sight, and I have been devouring her paintings on the Internet for years and years. Her blog was updated until 2012, though, and I could not find anything about her since. Now even her website is taken down (www.linejuhlhansen.dk). I don’t know what happened to her—I hope nothing is wrong. 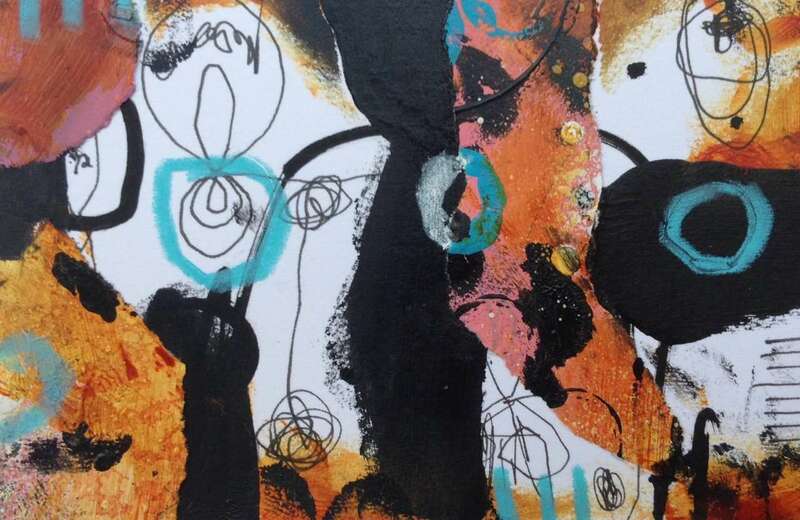 Line’s work is very graphic, and her compositions are very bold. Also, she uses letters from the alphabet in her work—both from newspapers and from stamping—which adds to the graphic nature. I love that. For a long time, there was a video with an interview of Line Juhl Hansen on Youtube (unfortunately it has been taken down). 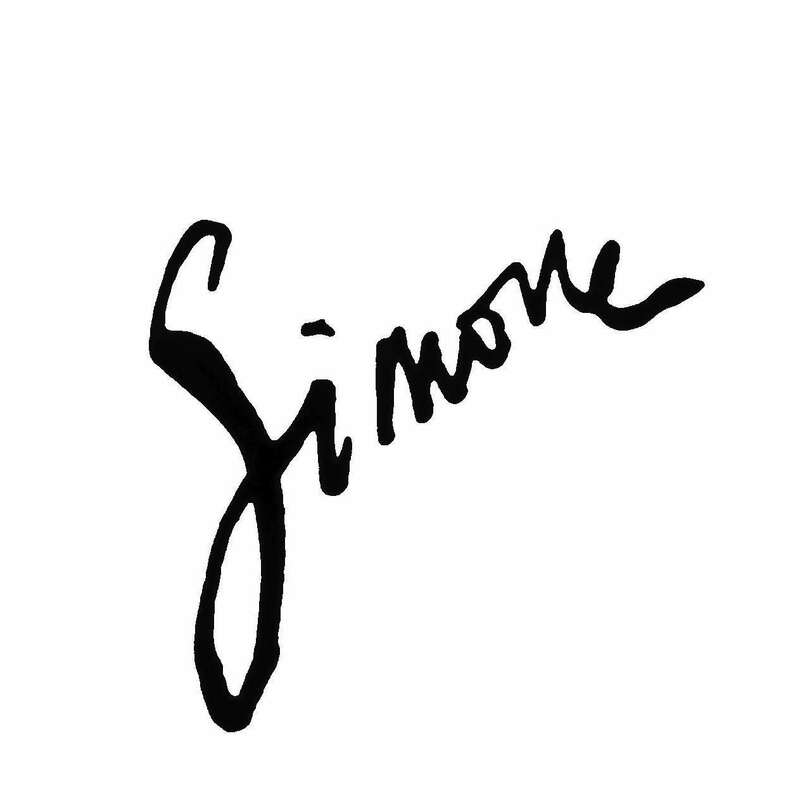 In that video, you see her while painting, using big brushes and making huge strokes. Those gestures inspired me not to be too careful with my own paintings and just paint my heart out. As I said, Line makes huge movements with her brushes, but at the same time, she creates very fine details. The big picture is beautiful, but if you look close up, the painting is just as exciting. In her work, you see all kinds of pictures. It gives her work a light touch. 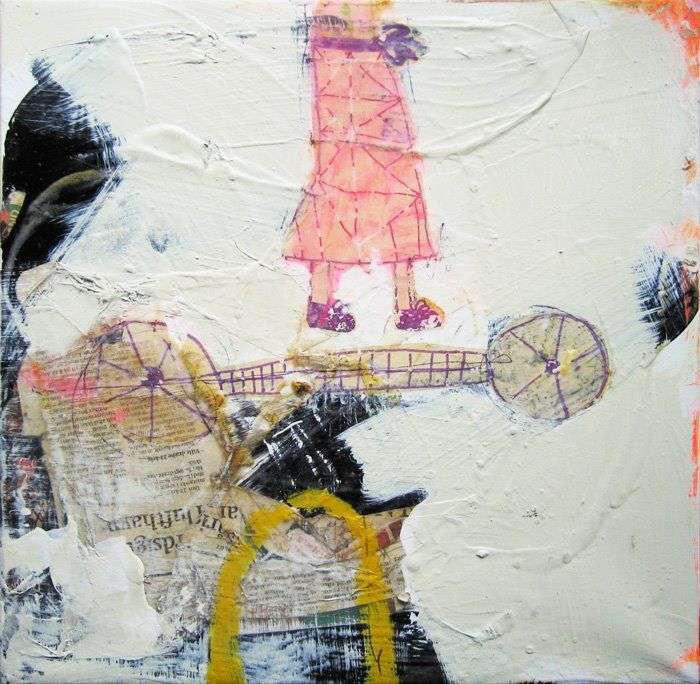 In her paintings, you can see lots of papers and other materials shine through. It definitely inspired me to dive into the world of collage and mixed media. 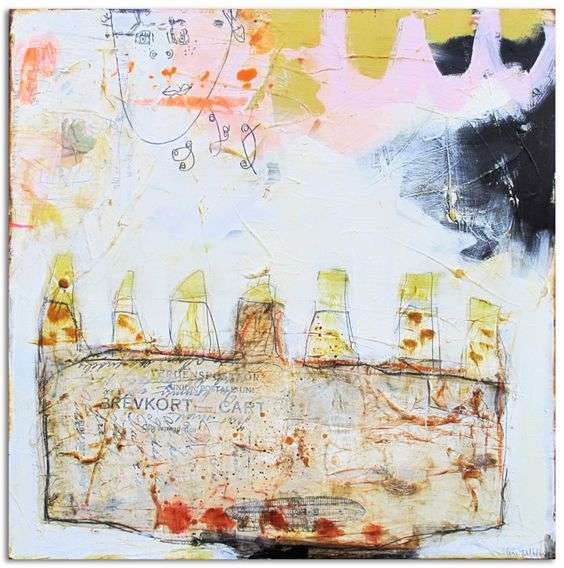 Line Juhl Hansen is one of those painters who use collage in a non-fussy way. I love the colors of her work, and from the Youtube film, I learned that she only uses three primary colors (blue, red, and yellow, and of course black and white). I found this fascinating, and immediately understood why her colors look so beautiful—they are inherently harmonious. Because she creates all of her paintings with only these three colors, they all fit beautifully together. That’s why I believe that you could see her whole body of work as one big piece of art. I experimented too with using three primary colors as she did—without much result. But later on, I tried it again, with different colors, and with more white in the mix, and that worked out very well for me. The constraint of using only three colors has given my daily painting a big push forward. That’s why I used this concept of just using very few colors in my online course. I have always loved rough textures, and Line’s work offers plenty of them. In the Youtube video I already mentioned, you saw her gluing huge pieces of brown paper on the canvas to create a basic roughness in her work. If you take a close look at her paintings, you can still see the rough wrinkles and folds of these underlying pieces of paper. In the Youtube video, she tells that she’s using a lot of layers, starting with big strokes and ending with the fine details. 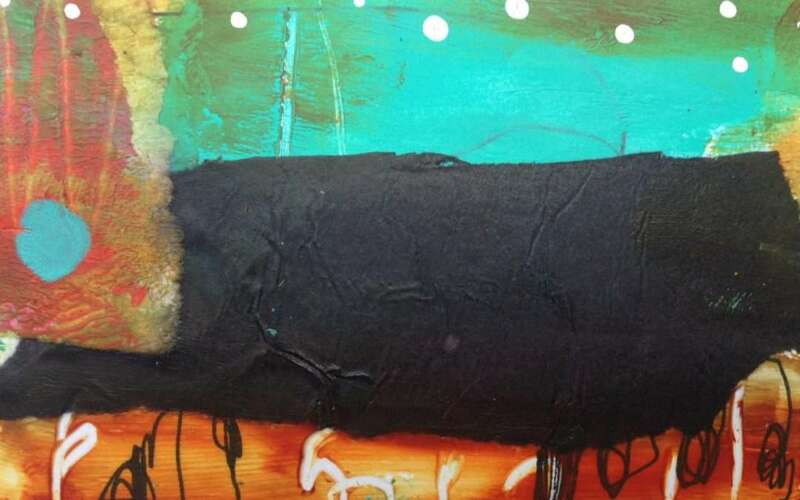 I love a lot of layers—they give depth and mystery to a painting, and her paintings are a perfect example of that. 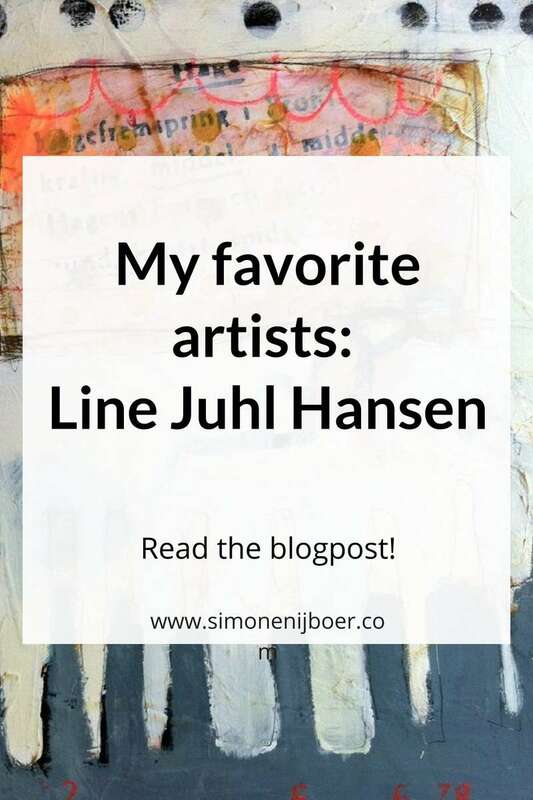 Below you can find some more paintings of Line Juhl Hansen (and I’m sorry that I’m not able to ask her permission to showcase them here). I hope you get just as inspired as I am. 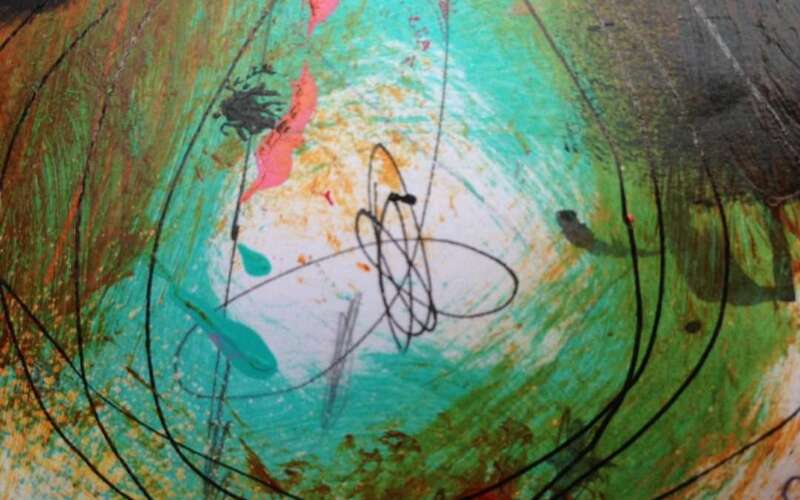 When I start painting, I usually start with scribbling, making marks, adding some paint. I am just doing something. I am ‘activating the canvas’ as some artists call it. I like that expression. Before, the canvas (or the paper) is silent, inert. Once I put some marks on it, it starts talking back to me. It starts moving and having its own opinions about where it wants to go. There evolves a wordless back and forth between me and the painting. It’s like an intimate dance, as I have described it in my blog post about non-duality and painting. 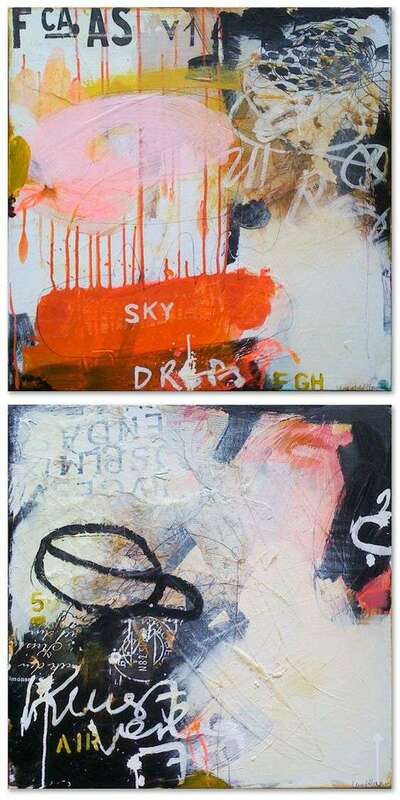 My first and almost random marks are a starting point; from there the painting will evolve, more or less out of itself. And even those first marks are not ‘random’ of course. They depend on my mood, or on the mark making tools close by on my table. If you get really philosophical, there could not have been another mark than that particular one. The whole universe led up to that one mark, you might even say. Lately, I was making a collage. I had made marks and covered some parts with a layer of glazing. The next thing I did was add a scrap of collage paper that almost covered all of the underlayer. My first thoughts were: Why did I even make all those ‘activating’ marks in the first place? They are useless now; nobody will ever see them. I might have activated the paper, but now there is nothing left of it. I could have glued the collage paper on the white substrate with the same result! But then an insight struck me. Those first marks not only activated the canvas. They also activated me! By activating the canvas, something inside me starts to move. My inner artist awakes. Inspiration strikes. The dancer enters the dance floor. My subconscious starts to flow, and from there, my hands start moving. In this case, my hands took a scrap of paper that had the size of almost the whole underlayer. But if I would not have made those first marks, my inner artist might not have awakened. I might have thought: Oh, let’s drop this collage. I have no inspiration at all today. I’ll paint tomorrow. These first marks did not only get the collage started, but they also got me started, and helped me to get into the flow of painting. My conclusion is: if you don’t know how to get into the flow of painting, just start somewhere. From there, your inner artist will wake up and lead you. Let me know your experiences with activating the canvas and activating yourself below in the comments. What I’m going to write about now might sound very difficult and theoretical. 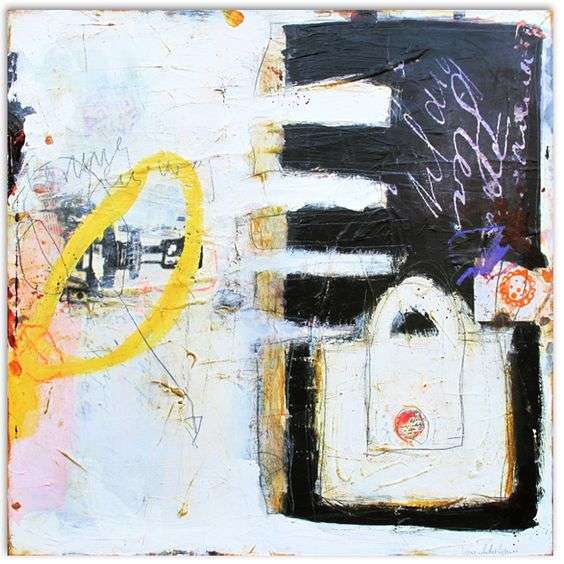 But I believe that every painter knows from experience what I will try to say here, and moreover, that it is one of the big reasons why people are so drawn to abstract intuitive painting. On the contrary, life is one big moving and flowing entity, and we are an integral part of it. A famous metaphor for this is the metaphor of the sea and the waves. You can see different waves if you are looking to the ocean, but they are all made from the same ‘stuff.’ The ocean is one swirling, moving being, and the waves fundamentally can’t be separated from it. We are brought up to believe and experience differently. When we were still in the womb, we did not feel any separation between our mother and ourselves. And when we were babies and toddlers, the sense of ‘I’ had not formed yet very well. But the older we grow, the more we start to feel separate from other children and our parents. And that’s a useful thing. Otherwise, it might be very difficult to survive in this world. There is a big drawback to developing this sense of ‘I,’ though. The older we get, the more we forget to realize that fundamentally, we are not separate from each other. We are all made from the same ‘stuff,’ just as the waves are made from the same water. And we don’t have to ‘find our way in life’ since we are life itself. Life is living its way through us. But even though my story is theoretical, we all have experienced moments that this fundamental ‘being-one’ is palpable, when we have a baby in our arms for instance. Or when we are immersed in nature, we sometimes can feel at one with the mountain that we hike, or the woods that we are in. But things don’t need to be ‘special,’ for you to experience the non-dual. Sometimes you can sit in the sun with a cup of coffee, and suddenly without reason all so-called ‘problems’ fall away, and you just ‘are.’ Or you throw old papers in the paper bin, and suddenly, for no reason, you experience a state of simple bliss. Or even if you pass by a very ugly industrial area, you can recognize the beauty that’s hidden in everything (which does not mean that you cannot fiercely fight the planning of ugly industry terrains, but that’s a whole different story). Soon after we experience this state of non-duality, our perspective usually returns to the habitual old dual perspective again. Life becomes something that’s threatening, or problematic, or that has to be dealt with. But there always stays a sweet memory of those non-dual moments, and deep down we know that that’s the real thing. That that’s life at it’s truest, instead of the ‘problematic’ life that we live most of the time. 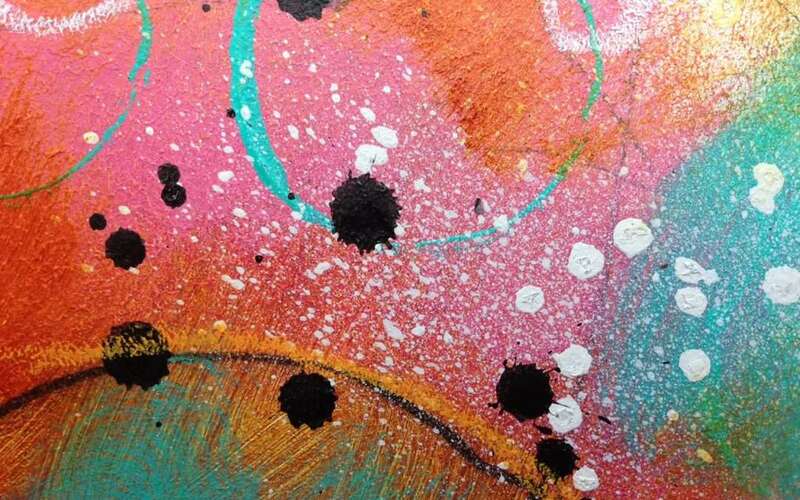 Now, what has this all to do with abstract intuitive painting? Usually, when we start painting, the painting that we want to make is ‘there,’ and we are ‘here.’ We have to work and to learn and to practice to get from here to there. And of course, this is true. We need to go the store and buy paint that we did not have before. We need to learn how to apply the paint to the brush, and how to move it around. But this is all very practical, and we don’t experience that as problematic or difficult. The problematic part is the way that we are afraid that we will not be able to paint a beautiful painting. We doubt ourselves, because we don’t know how to force the paint where we want it to go. 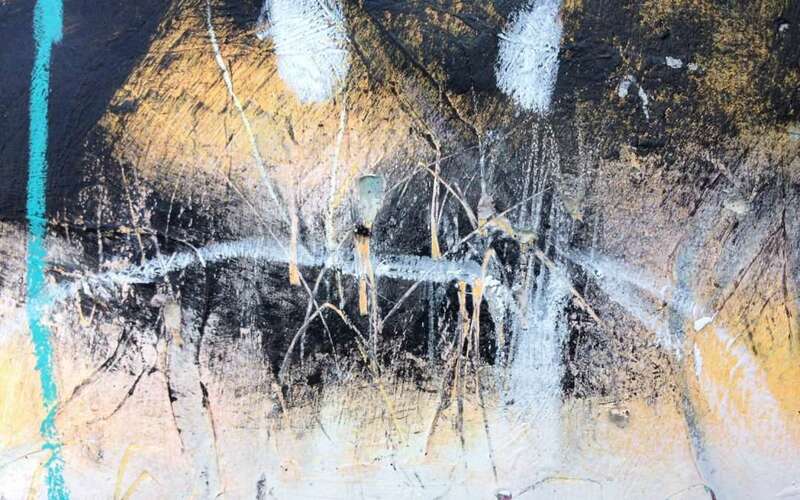 We struggle with our materials, and we can be very critical about the results, and about ourselves as painters. We secretly think we are not ‘real painters.’ And we usually compare ourselves to ‘the other painters,’ who make ‘better work,’ and therefore are the ‘real painters’ that we would like to be. In that ‘non-dual’ awareness, we don’t work with paints and colors and textures and shapes, no, we are paints and colors and textures and shapes. We as separate individuals disappear, and there is only the act of painting left. We are dancing with our materials, and our materials dance with us in one colorful dance. Making a painting from that non-dual perspective is effortless. Every step on the road evolves from the former in a completely natural way. We don’t have to think about our next move, we just ‘wait’ for it, look forward to it. We are curious—hey, how will this turn out? What will my brush do? Which crayon will jump in my hand? What color will appear? I am convinced that people are drawn to making abstract intuitive art because they know deep down that this is how they want to live. Effortlessly, dancing with the world in a completely natural way, without striving or competing, without pressure or self-doubt. This does not mean that you can’t analyze your work afterward. You can recognize what works in a painting, and what doesn’t. You can feel what your emotional response is to your work, what you don’t like and what you do like, and reflect on that. Learning about value, colors, mark-making techniques, and so on is not opposed to ‘non-dual painting,’ either. All those things don’t interfere with your free-flowing movements. On the contrary, they become an integral part of the dance between you, your materials, and your evolving painting. And here we come to why I believe that daily, or regular, painting is so worthwhile. If you paint often, you train your ‘non-dual muscle,’ so to speak. You recognize better when you are entering the state of non-duality, and you can more easily stay there. You realize when you are getting constricted in forcing yourself, and you practice letting go of striving. You start trusting that this oneness is always there. You just have to change your perspective. ps: Please share your experience and ideas below! I would love to read them. The last few days I have been very busy, so today I almost thought: let’s skip my daily painting practice. But then I remembered what I’m ‘preaching’ to others: ‘You can always make something simple on the back of a business card’. And so I took my own advice. I took out some leftover scraps of a piece of collage paper that I made a while ago. And I took my Molotow marker, fineliner, liquid acrylics, matte medium and crayons. And I made a small collage. You can watch the process below in the video. At this moment, I am in the process of creating an online course about collage making. Take a look here for more information. You can leave your name on the waiting list!